Day 3 - Rise early and make way for the starting line. Finally, race day is here. It seems we've already had an adventure of sorts with our train trip and tour of Baltimore, but today begins the true purpose of our journey. scurries about with focused intensity making ready to set sail. The wonderful scent of brewing coffee and frying bacon wafts up from the galley. The sky is cloudless, the winds from the south and gentle. Conversation is soft, if there is any at all, as we each commune with our thoughts and the one hundred thirty miles of water that await. I am surprised to see such quick-footed movement from these young sailors who yesterday moved as if under water, the same crew who shuffled aboard in the wee-hours muffling their giggles and chatter. They are here to work now and they are serious, despite throbbing heads and thick tongues from their night of revelry and merriment. Youth is their best defense against the weariness, the crisp morning air and glistening sunlight just the jolt to brighten spirits and charge the body. For the next forty-eight hours their skills and training, endurance and expertise, even their patience, will be tested. This is why they are here, and why I am here to be part of it. Other tall ships are beginning to stir, other crews bustling about making ready, as thirty seven other boats begin moving slowly out of the marina. The muffled sounds of engines purring, diesel fumes on the breeze. 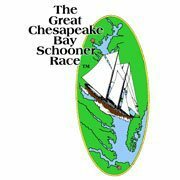 We will motor out of Baltimore Harbor and into the open channels of the Chesapeake Bay before hoisting sails. With winds from the south as they are, I doubt we will cut the engine until we cross the official start line - when it is mandatory. We will race under sails only. Until then, we're going to need whatever boost we can manage to reach the start in reasonable time. the calm while it lasts, because it will change, and the change will no doubt be extreme. The afternoon rolls by as slowly as the waves against the hull and the gentle flapping of the sails. I can't say I have any complaints. The sun was warm, the conversation relaxed, and my guilt for not having touched my writing project or the book I brought along seems meaningless. We all feel very spoiled and very rich on this glorious day. Around four o'clock there is a brief flurry of activity as we approached the Chesapeake Bay Bridge Tunnel, and open water beyond. Cook brings out a tray of dips and crackers, and the bar officially opens. What a delightfully lazy day. While I know the crew is working hard, tacking often, and trimming sails to catch whatever breeze they can, I for one simply enjoy the salt air and sunshine, and sharing memories with my brother about the times our father took us out fishing in our little sixteen foot Grady White in these same waters. Then we were tossed about like a bath toy, but today the sea was easy.